In honor of the new ComFishFilmfest website, we themed a few prints of the Humpynami “Red Tide” T-shirts with the colors from the new website. Yes, you can get your hands on these T’s at the Pacific Marine Expo this coming week. We have limited numbers and we will be printing another round in different colors. The Humpynami concept is the brain child of Bob Poor and his artist friend Roger McKay did the layout. I used Aurora Projekt here in Juneau to print these limited editions up and we will have more to come in the next few weeks. 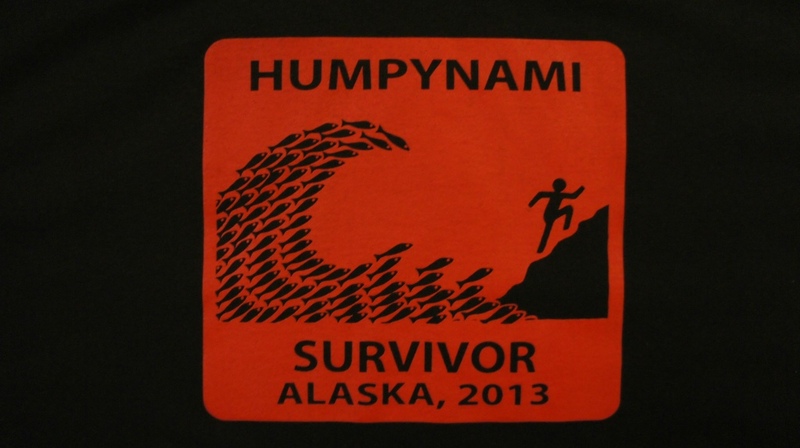 If you were part of the incredible summer that we had last year, then you need a Humpynami T shirt. All proceeds go to the upcoming ComFishFilmFest “Pub Trawl” Film Tour, coming to a local bar near you. More details coming soon… Oh yeah, the website is up too, check out www.fishfilmfest.com to see our new digs. It’s not quite an official launch, but whoever reads this is welcomed. Sign up on the new website (sorry facebook sign on is a work in progress) and you might just win one of these T Shirts. HEY YO! jt! Are you aware? Best BH Oh no! This domain *juneautek.com * expired *12 days ago*! Please contact the owner of this website and ask them to renew the domain. Don’t worry, you’ll still be able to view the site at this web address: juneautek.wordpress.com. Oops! So busy with the new fishfilmfest.com. Sorry about that. hero and heroine is one of these doorways?